Dagenais, Maxime. "Aroostook War". The Canadian Encyclopedia, 28 February 2018, Historica Canada. https://www.thecanadianencyclopedia.ca/en/article/aroostook-war. Accessed 25 April 2019. The root cause of the Aroostook War was the timber trade. During the Napoleonic Wars (1803-15), Great Britain was cut off from the European continental trade. Forced to find another source of wood for their ship masts, it looked to its North American colonies. 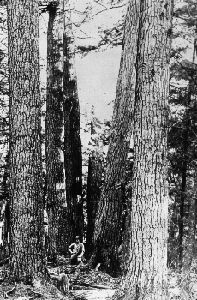 New Brunswick – and more specifically a region known as Madawaska – was home to vast white pine forests. Britain thus began importing mass quantities of wood from North America. Timber exports in New Brunswick skyrocketed, representing two-thirds of the province’s total exports in 1825. As timber became an important commodity, prospectors from southern Maine, Lower Canada and New Brunswick arrived and began competing in the region. The western part of the border was left to interpretation,with Britain claiming lands as far south as the Aroostook River valley and the United States claiming land almost as far north as the Saint Lawrence River. In fact, even a commission (1816-21), led by American Cornelius P. Van Ness and British representative Thomas Barclay, failed in the attempt to determine the boundary once and for all. Both sides came up with drastically different borders and neither was willing to give up any of the disputed territory. Though both nations claimed the territory, neither was willing to go to war for it. Nevertheless, the region was ripe with tension, which soon became fertile ground for confrontations. Illegal loggers and trespassers often clashed with state and colonial authorities, and violent confrontations ensued between American and “provincial” loggers. Following Maine achieving statehood in 1820, the situation intensified as local politicians began taking a much stronger stance on their claims in the region, using extreme nationalism to push for the state’s complete control. The arrival of Americans who shared similar attitudes added further tensions. In the 1820s, a number of American families settled in the disputed territory. John Baker, who had arrived a little earlier, and was their most prominent settler, loudly upheld Maine’s position. 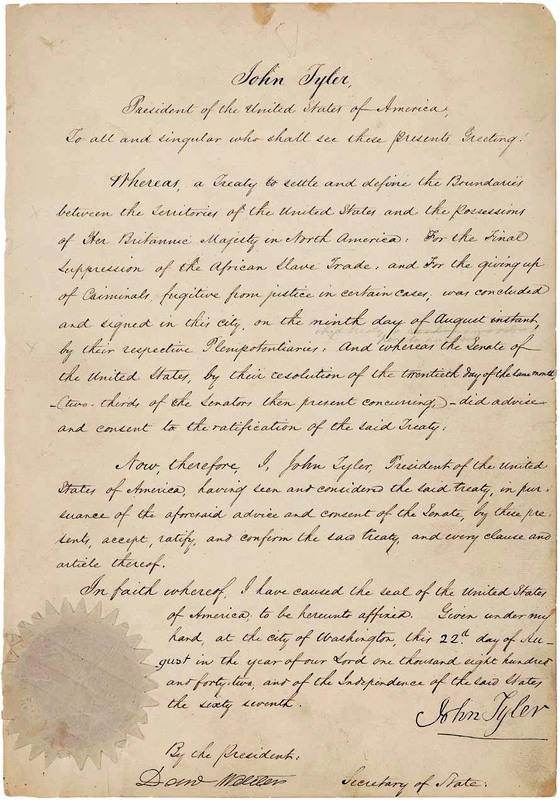 On 4 July 1827, Baker proclaimed the independence of the territory – “Madawaska Republic” – with the explicit aim of joining the United States. When Baker began intercepting Royal Mail, British authorities grew impatient and arrested him. Baker spent several months in jail before being found guilty of sedition and conspiracy, and he was sentenced to two months in prison, and given a 25-pound fine. 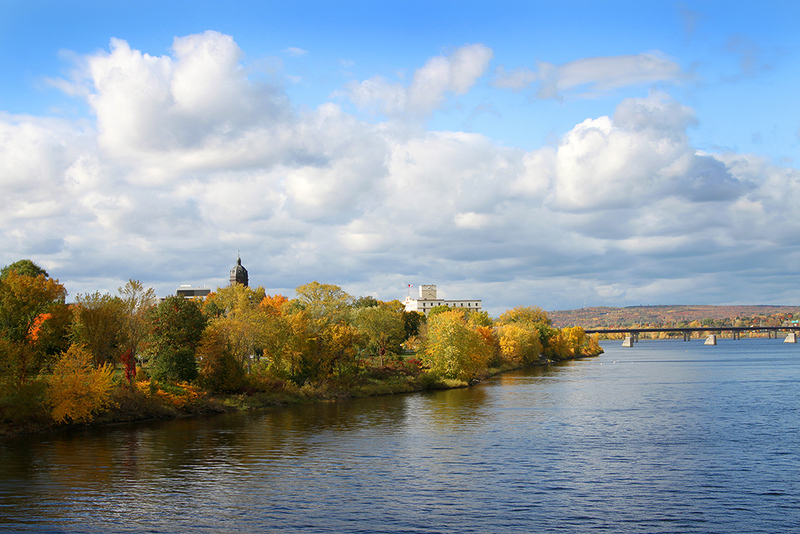 View of the Saint John River in Fredericton, New Brunswick. Photo taken on 14 October 2015. As a result of the growing tension in the region, both the British and American governments asked King William I of the Netherlands to arbitrate the border dispute. In 1831, he concluded that the Saint John River should act as the boundary. Though both London and Washington would have accepted this compromise, the residents of Maine were less enthused and immediately rejected it. They wanted all of the disputed territory and even incorporated it into a township to reassert their claim over it. In 1838‒39, the situation further intensified, almost leading into an armed conflict. Following his election, Governor John Fairfield sought to further Maine’s claim. Concerned that New Brunswick “provincials” were illegally trespassing and logging on the territory, Fairfield sent a group, led by Rufus McIntyre, to the region. Authorities in New Brunswick interpreted this move as an invasion and quickly despatched troops to the Saint John. McIntyre was captured by loggers from New Brunswick and was immediately sent to provincial authorities. Fairfield responded by sending the state militia, and a standoff ensued. To prevent at violent conflict in the borderland, American Secretary of State John Forsyth and the British Minister in Washington, Henry S. Fox, came up with an agreement: while New Brunswick authorities were allowed to keep regulars in the Saint John valley, Maine officials were allowed to maintain an “armed posse,” but not the militia, along the Aroostook River valley. And to protect their claim to the region, Maine and New Brunswick officials built a series of blockhouses and military stations. Map to illustrate the boundary line established by the Treaty of Washington of the 9th. of August 1842, between Her Majestys Colonies of New Brunswick and Canada and the United States of America. Though the Aroostook War happened thousands of kilometres away, it appeared to have some impact on the Canadian Rebellion. 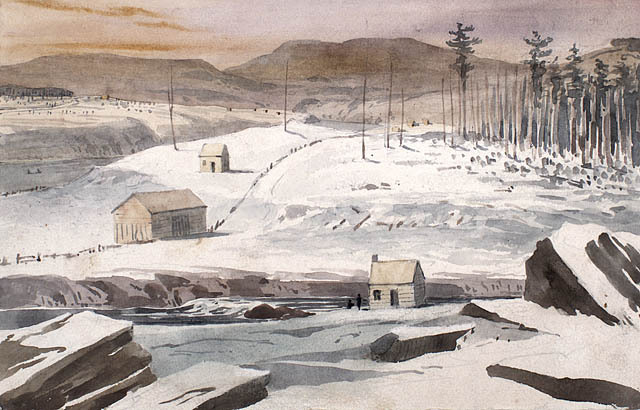 According to recent scholarship, both the Canadian rebels and Mainers opposed to the British supported one another; they hoped that the conflict over the disputed territory could lead to war between the two nations, resulting in a British defeat. A common front against the British was even discussed by representatives from Maine and the rebels, but nothing serious resulted from this. In fact, neither nation was willing to go to war. A few years earlier, British and American officials similarly refused to go to war after a series of violent events – such as the Caroline Affair – increased tensions along the American-Upper and Lower Canadian border. Neither nation wanted to lose the valuable trade relationship that they had forged over the years. 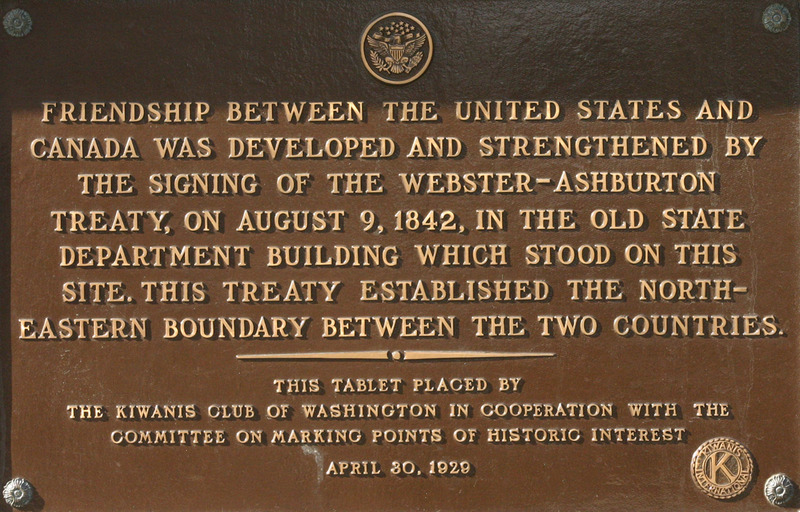 The tense standoff in the disputed territory was finally resolved in 1842 with the Webster-Ashburton Treaty. 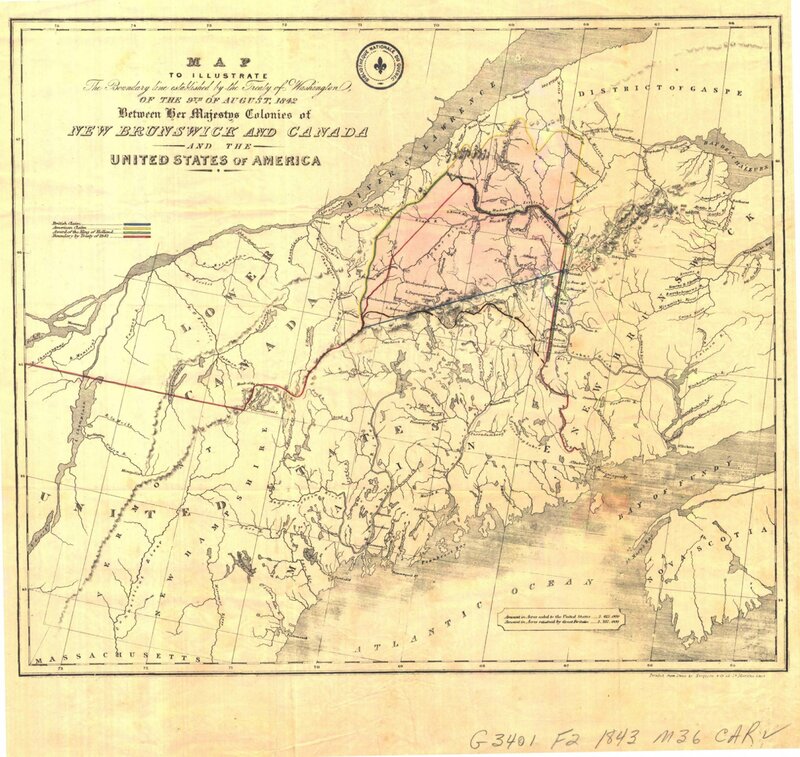 Following this “gentlemen’s agreement,” the St. Francis and Saint John rivers were selected as the boundary dividing New Brunswick and Maine. While both powers shared the Saint John valley, Maine remained the sole proprietor of the Aroostook valley. 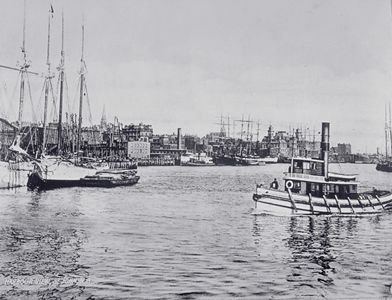 Maine was also granted navigation rights on the Saint John, which pleased local lumberman and allowed for timber development in northern Maine. Though some politicians in Maine were still unwilling to part with any part of the disputed territory, they eventually acquiesced, finally ending conflict in the region. See also Madawaska: A Canadian-American Borderland from Colonization to Division. Beatrice Craig and Maxime Dagenais, The Land in Between: The Upper St. John Valley, Prehistory to World War I (2009). Geraldine Tidd Scott, Ties of Common Blood: A History of Maine’s Northeast Boundary Dispute with Great Britain, 1783–1842 (1992). Julien Mauduit, 'Vrais républicains' d'Amérique : les patriotes canadiens en exil aux États-Unis (1837‒1842), PhD diss, Université du Québec à Montréal (2016). Maxime Dagenais, “‘ …Those Who Had Money Were Opposed to Us, and Those Who Were Our Friends Were Not the Moneyed Class”: Philadelphia and the 1837–38 Canadian Rebellions,’” American Review of Canadian Studies, 47, 1 (2017).